Four years ago Google bought a British artificial intelligence (AI) company called DeepMind for half a billion US dollars. The founders studied computational neuroscience together at University College London, and their technology applies deep learning on a convolutional neural network using a form of reinforcement learning. The company gained considerable publicity in 2016 when its AlphaGo program beat the world champion Go player in a five-game series that was featured in a documentary film. 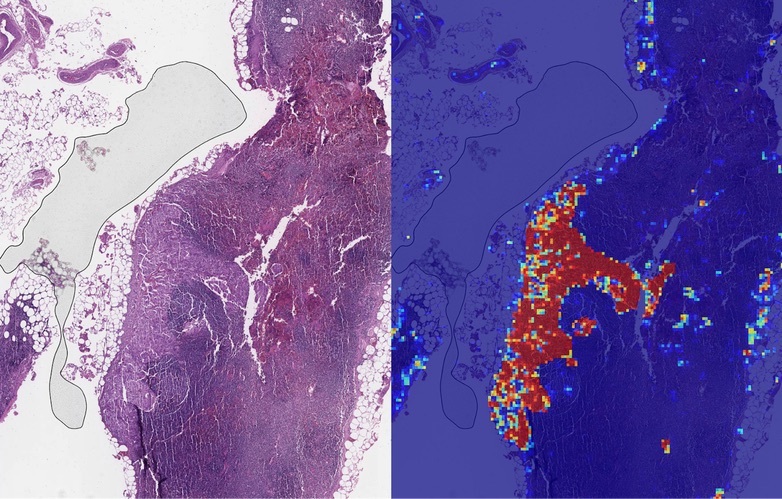 In another Google initiative, their AI team based at corporate headquarters in Mountain View, California, has applied deep learning to metatstatic breast cancer detection. In collaboration with clinicians at the Naval Medical Center in San Diego, they have just published a paper in Archives of Pathology & Laboratory Medicine entitled “Artificial intelligence-based breast cancer nodal metastasis detection: Insights in the black box for pathologists.” A laborious aspect of a pathologist’s job is to conduct microscopic examinations of biopsy specimen slides, and determine if the malignant cells have spread from the primary site in the breast to the nearby lymph nodes. The researchers developed a deep learning algorithm called LYNA – short for LYmph Node Assistant – which has reached a level of sophistication enabling it to tell the difference between cancerous and healthy tissue with an impressive 99% accuracy. Seen in the slide on the left (© Google) are lymph nodes with multiple artifacts, including an air bubble, cutting streaks, necrotic tissue and blood. LYNA was able to identify the tumour region (highlighted in red in the slide on the right), and it correctly classified the surrounding region, despite being laden with artifacts, as non-tumour (shown in blue). Has CapeRay considered getting Google to help in the development of a 3D ABUS combo machine (for which you have the patents), enabling you to identify up to 95% of early breast cancers in women with and without dense breast tissue?